Notes: I knit 11(?) repeats of the Ripple pattern and then one Medallion. I miscalculated how much yarn I had so I couldn't knit the edging. I knit a few rows of garter and bound off. I was going to post this one simply as "Angry Duck." But after talking it over with Wes it's now "Angry Bird with a Menorah on its Head." What the hell is this? There's mesh and faux cables and fins and this model is still totally naked. What is the purpose of this amalgam of texture? How incredibly uncomfortable will it be to sit in? It's 2000-3000 yards of polyester. This is 24-33 skeins of yarn! This will cost $312-429 to make!! The largest size will weigh 3.6 pounds!!! What was the thought process here? This weekend it hit me. I had The Blahs, also known as Knitters' Ennui. I looked at the projects I was working on (a third Retro Prep sweater, Tideline, baby vest) and just felt so "meh." In fact I felt so blah about them that when I realized I had left my Retro Prep in the my car I didn't have the enthusiasm to stand up and walk outside to get it. I needed some inspiration. I flicked through my Ravelry queue. Meh. Seriously, I have 228 items queued and already have the yarn for dozens of them and I just couldn't get excited about any of it. So I decided to work in reverse. I pulled out several containers filled with yarn and spread them out on my dining room table. 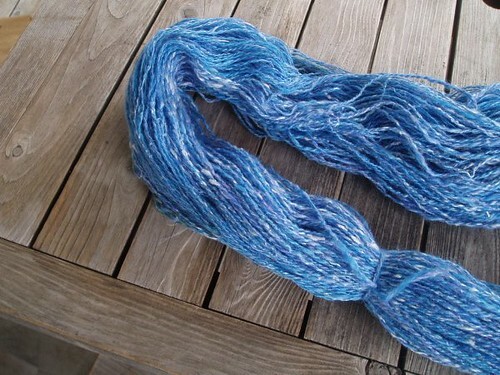 A ball of handspun that I made in June 2006 caught my eye. 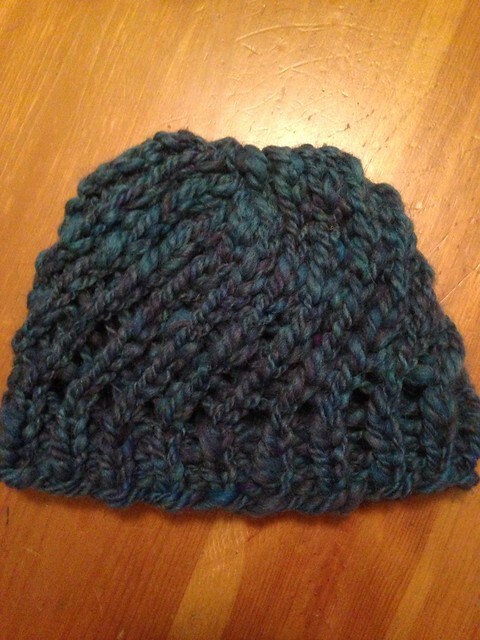 I did a pattern search for 30-50 yards of bulky or super bulky yarn and picked the Winchester Hat. Knocked that sucker out in an hour. Then I was energized. What next? I scanned the table. Wool/Mohair/Silk also spun in 2006 when I was a baby spinner. It's not great yarn. I've tried using it for other projects and it never looked right. I decided to just knit a simple triangle shawl with it but as I was starting I changed my mind. 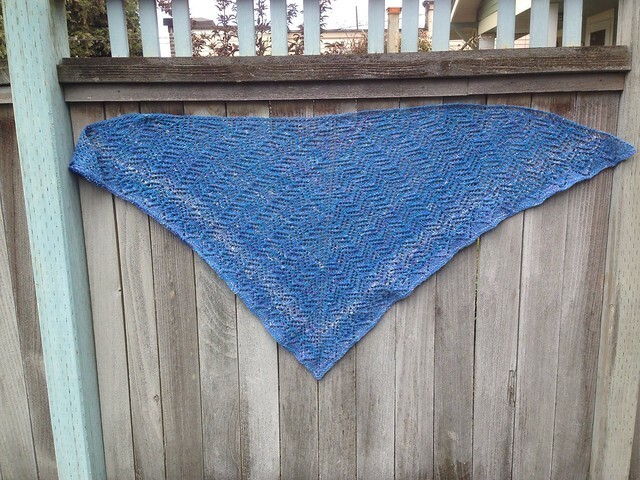 A customer had been knitting from Evelyn Clark's Knitting Lace Triangles at the shop last week. I'm a huge fan of Evelyn's and love that book. It is no longer in print but Evelyn revamped and released it as an e-book last fall. I chose to do the Ripple Lace throughout. I might throw in some Medallion Lace toward the end. But I can barely put it down. I'm back in the game and over The Blahs. What do you do to overcome The Blahs? 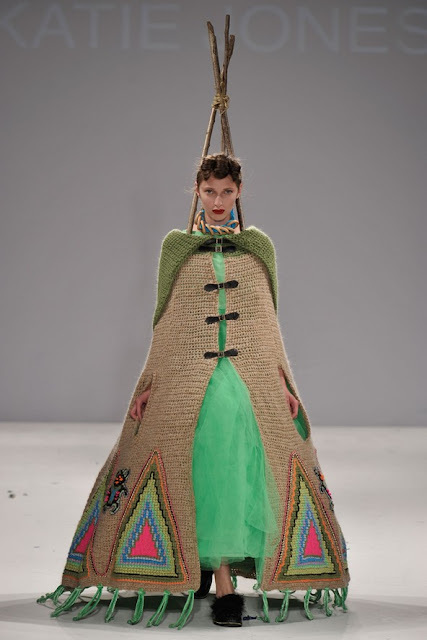 Why crochet something utterly ridiculous and unwearable when you can make it culturally insensitive too? 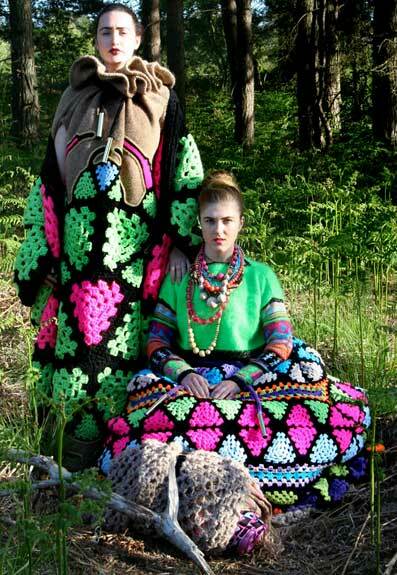 And speaking of appropriation, just swipe Granny's afghan while you're at it. Notes: Another tube. 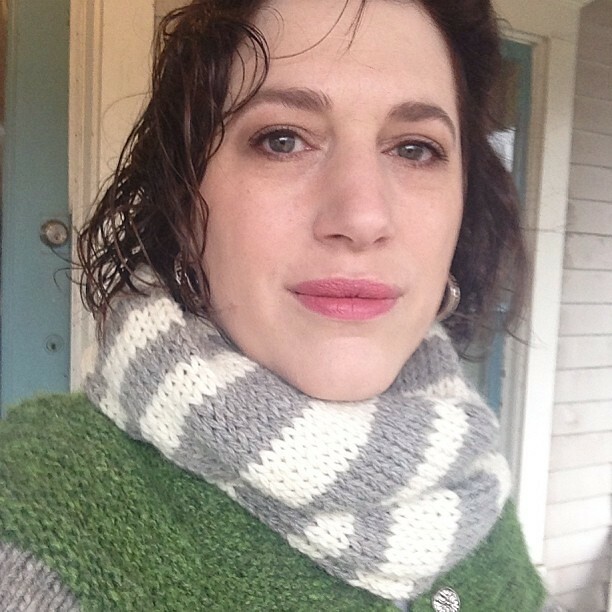 I did a provisional cast on and knit random three or five round stripes until I ran out of yarn then grafted the ends together. It's really soft and warm and will go with everything. There are some who believe that less is more. For others, more more is more. I mean, why just wear crocheted pants when you can wear crocheted pants, a crocheted jacket and a crocheted cowboy hat? It's just common sense really. And why stop there when overalls exist? If you'd like your own pair of crocheted pants for a mere $350 that are "crocheted from 100% acrylic yarn" then you can pick some out here. A few weeks ago I was about to head to the movies with Older Son to see Silver Linings Playbook (believe the hype, it's really good). I like to knit at the movies. It keeps me from fidgeting and from biting my nails. However I can only knit stockinette in the dark. My true preference is stockinette in the round. I usually cast on for a charity hat before a movie and knit the ribbing earlier in the day then knit the plain stockinette at the show. But on this day I didn't have time to knit an edging so I just did a provisional cast on in this 100% alpaca. I thought I'd knit the hat then put the edging on later. Alpaca is one of my favorite fibers but it's really not great for hats. It's slack, has no memory and gets kind of slithery as headgear. 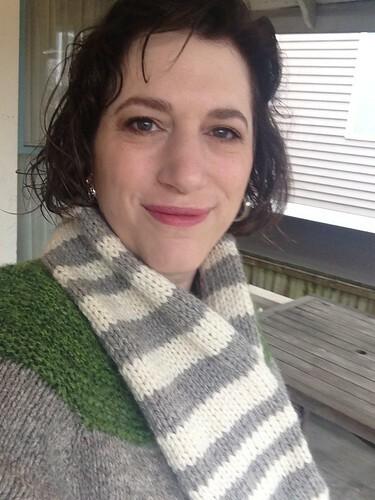 Then I thought I'd make a cowl. And lastly I decided to make a baby vest. Here's my tube with a (barely visible) provisional cast on along the bottom edge and three "kangaroo pouches" started. 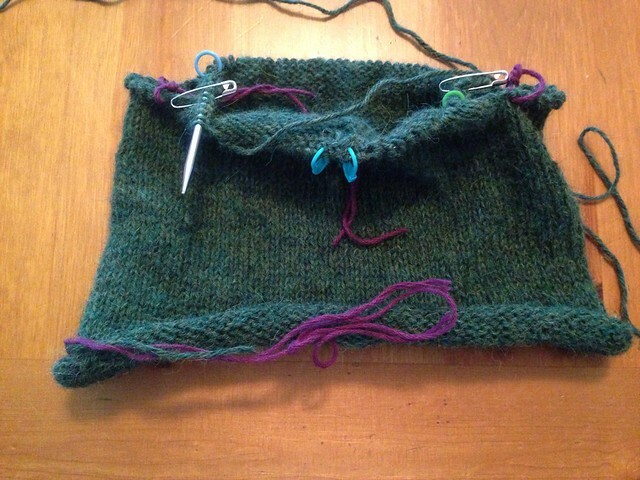 Two are the armholes and one is for the neckline. 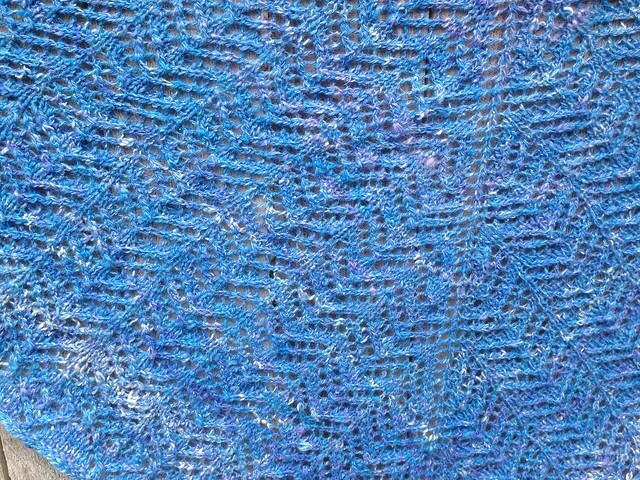 A kangaroo pouch is an Elizabeth Zimmermann technique for placing a steek in the middle of your work. You slip stitches onto waste yarn then cast on steek stitches (you can use backward loop, it doesn't have to be pretty) over those stitches and continue knitting. I'll continue decreasing along these lines to shape the armhole and the neckline and once I've joined the shoulders I can cut the steeks and finish those edges. I'm really happy I chose to do this since I can just play with my knitting. There's no pattern to follow. I decide what the openings should be like. Frankly, I'm not very experienced using these techniques to create shaping so it's a bit of an experiment. But in the end if I'm not 100% in love with the result it will still keep a baby warm so there's no harm in exploring.